Are you planning a party? Wedding? But you’re unsure where to begin? Here’s a tip. Select a theme — like any of the following wedding reception themes — to help you create the highlights and fill in the details. Wedding reception themes make it easy to organize your celebration. ANY celebration, actually, not only weddings. Stretch your imagination — sky’s the limit! You can use wedding reception themes for graduation parties, a company banquets, informal block parties, festive holiday parties, or professional networking meetings. Anything! 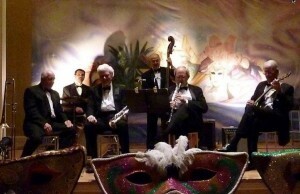 For example, here we are in a “Masquerade Ball” party on a recent New Year’s Eve. Created and organized by my friend Rick Herns. Using wedding reception themes gives you a tremendous advantage, which I referred to in a recent post on my Facebook Page. Got a favorite secret for a successful party? I often recommend using a “theme” to systematically coordinate important details like arranging the music, and all the rest: invitations, publicity, food, flowers, colors & decor, photography, party favors, timeline, costumes, activities, and toasts. Naturally, there’s more than one way to plan music for a party, but using a wedding reception theme is a great one! How about YOU? Did you use a theme for your last party? How did it help?